"Each of these spare and elegant tales rings like a bell in your head. memorable, original, and not much like anything you've read." --Karen Joy Fowler "A strange and enchanting book, written in crisp, winning sentences; each story begs to be read aloud and savored." --Aimee Bender "Horse, Flower, Bird rests uneasily between the intersection of fantasy and reality, dreaming and wakefulness, and the sacred and profane. Like a series of beautiful but troubling dreams, this book will linger long in the memory. Kate Bernheimer is reinventing the fairy tale." --Peter Buck, R.E.M. In Kate Bernheimer's familiar and spare--yet wondrous--world, an exotic dancer builds her own cage, a wife tends a secret basement menagerie, a fishmonger's daughter befriends a tulip bulb, and sisters explore cycles of love and violence by reenacting scenes from Star Wars. Enthralling, subtle, and poetic, this collection takes readers back to the age-old pleasures of classic fairy tales and makes them new. Their haunting lessons are an evocative reminder that cracking open the door to the imagination is no mere child's play, that delight and tragedy lurk in every corner, and that we all "have the key to the library . . . only be careful what you read." "Hauntingly poetic . . . By turns lovely and tragic, Bernheimer's spare but captivating fables of femininity resonate like a string of sad but all-too-real and meaningful dreams. This is a collection readers won't soon forget, one that redefines the fairy tale into something wholly original. 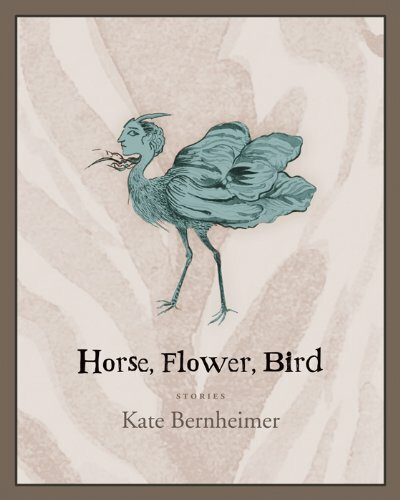 ""Booklist"
"[Bernheimer's] strangely moving stories, such as the eight collected in Horse, Flower, Bird, combine fantasy with deep wisdom; the illustrations by Rikki Ducornet are an added delight. ""Reader's Digest"
"Deep-seated fears find their way into these eight brief, dark adult fairy tales . . . These stories are the product of a vivid imagination and crafty manipulation by their skillful creator. ""Publishers Weekly"
Imaginative . . . lean and lyrical writing . . . Bernheimer s passion for fairy tales is evident in every story she spins . . . [her] work provides a refreshing contrast to most available fiction. It is no stretch to compare her to Aimee Bender or Kelly Link. "Library Journal"
Quirky, twisted . . . quietly unhinged narratives by an author who reinvents the fairy tale. "Kirkus"
This is a delightful collection of strange tales. . . . The stories are also accompanied by anthropomorphic illustrations by Rikki Ducornet, which are wonderfully befitting of the tales. This made for a quick read, as once I was pulled into the worlds of these stories, I did not want to stop reading until I found out where Bernheimer was taking me. "NewPages"
"[H]orse, Flower, Bird possesses everything you want to find in remarkable, enchanting, and lasting fairy talesthe delightful, imaginative kind of stories you want to tell in front of fires, or on the phone late at night under the covers, the stories you know you will never tell as well as the original author, the ones about phobias and cages and learning to love cages, but you know you have to try and retell them anyway. ""Puerto Del Sol"